The first mile. A nice downhill to ease me in. I was pooped after about five minutes. I did start off at a run. In fact, I ran solidly for the first 5K, and then kinda sorta solidly for the next 5K. I started to get excited that I might do better than I thought. The next three miles were off and on. The muscle at the top of my left thigh started to seize so I had to walk that off. That’s my story, anyway. The “I think I’ll walk now” bridge at the 7K mark. Bridges are deceptively challenging. Then there were a couple of longish hills—not too steep but enough to monkey with my mojo. I tried to run where there were groups of people cheering (folks on stilts, drag queens … you know, the usual) to keep from being totally shamed. Not that I had much to worry about, mind you. There were plenty of people behind me. 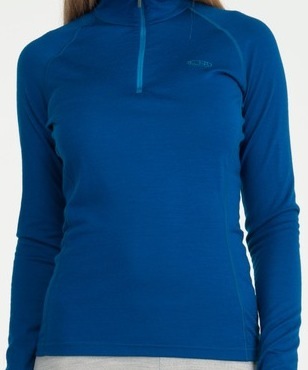 Turns out even the most co-ordinated Lululemon outfit can’t make you go any faster. Here’s where I hit the (sea)wall. 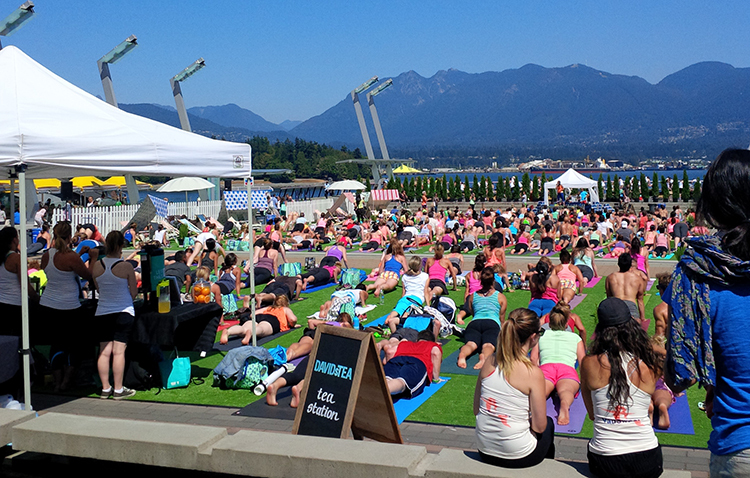 Once I reached the seawall though (mile nine), I was pretty much done for. (Gives new meaning to hitting the wall.) So was everyone around me, by the looks of it. 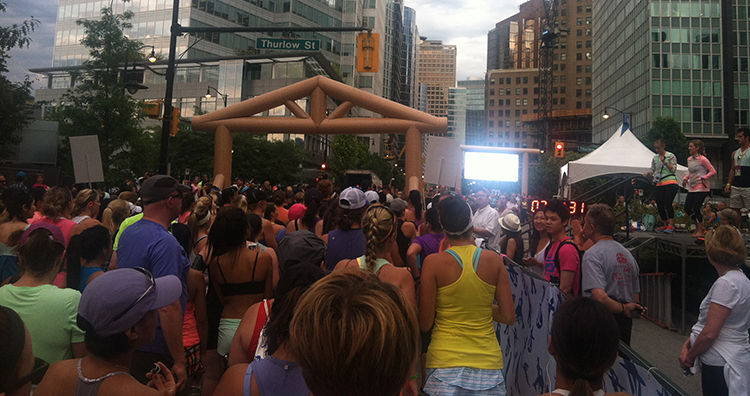 SeaWheeze doesn’t do bibs, so the event only vaguely resembled a run at that point. Occasionally someone (me) would get a burst of energy and take off, only to fade 30 seconds later. I continued on and off in this fashion until just before the finish line, which I crossed at a run (I started running just in time for Hubby to see me. He later commented that he was impressed that I was still running. I am a fraud). 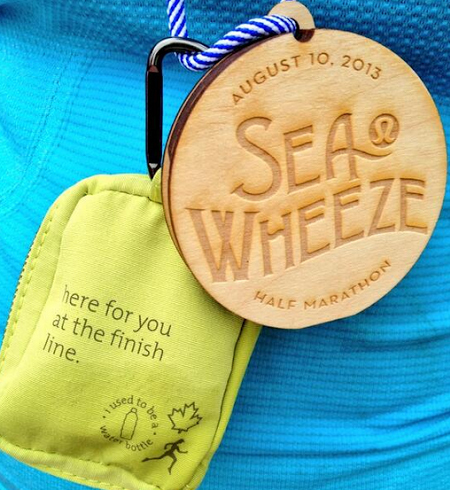 Medal and essential oils at the finish line. Mission accomplished (i.e., finishing upright), I gratefully accepted my wooden medal, teeny bottles of pain-relieving oil concoctions from a local natural-products store (very cool), and Skull Candy headphones for my trouble. Who said the pain and insane cross-country travel in a really small amount of time wasn’t worth it? This was a fabulous event. The T-shirt: No shirt, but I bought a hoodie from the store, and Hubby bought me the T-shirt with a sasquatch in a Mountie hat on the front. The aftermath: There was a runner’s brunch but by the time I was done the lines were crazy, so we left and had crepes instead. 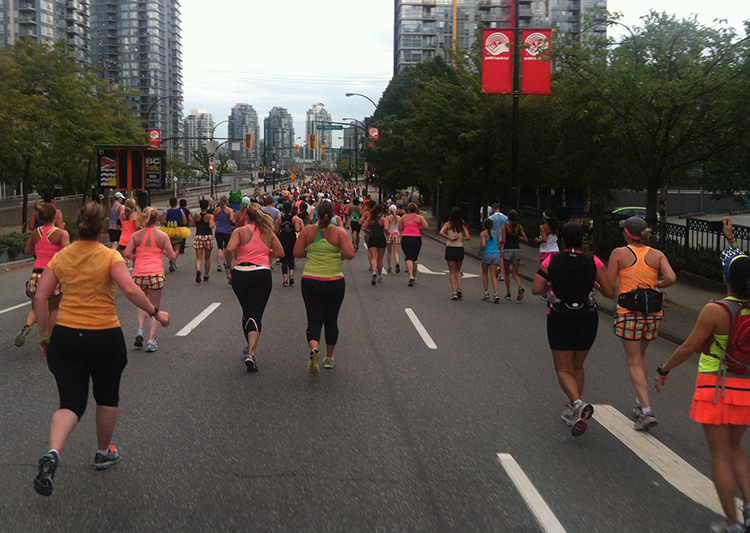 This entry was posted in Fitness, Humor, Running, Sports, Uncategorized and tagged half-marathon, Lululemon Athletica, SeaWheeze 2013, Vancouver. Bookmark the permalink. Since I’ve done a couple half marathons ;-), I speak from experience, crossing the finish line upright is HUGE!!! The last half I did I crossed, got my medal, took a couple pictures and proceeded to vomit and lay down on the ground, next to said vomit (I think I was dehydrated, 2 beers pre-run, was not smart, but anyway). It looks like a beautiful place to run any kind of race. I’m thinking about adding it to my race wish list. Congrats!! I’m impressed! This commentary sums up my own half-marathon experiences well 🙂 Also I love that your brain only runs in miles. This looks awesome! And, yes, quite the sea of Lulu (do you see what I did there…sea…sorry 😉 ). I have a half coming up in less than 2 weeks and the last couple weeks of training have gone out the window so I’m afraid I’m gonna be in a similar boat than you!